Hey everyone! The APF is creating our own version of a "Kid's Corner" focused on children with EPP. Our website will soon have a section called Shadow Jumpers. This will be a place for kids to learn from others with EPP, to share their own tips and tricks on things like what to wear, what to do for fun, insight for parents and so much more. We need your help to get started! What clothes and trends do you use when covering up from the sun? ·What are the ways you adapt to do certain activities outside? ·What are fun things you do to pass the time inside while the sun is out? ·What have been your best vacations? ·How do you manage in the car? Learning to drive? ·What do you do when you feel sad or left out? ·How do you manage going to school? ·How do you describe your EPP to other people? ·...and anything else you think may be helpful to others! We encourage you to send pictures or videos pertaining to your tips! Stay tuned for more from Shadow Jumpers! The APF is participating in #GivingTuesday on Tuesday, November 28 - a global giving movement that has been built by individuals, families, organizations, and communities in all 50 states and in countries around the world. Millions of people have come together to support and champion the cause they believe in helping. 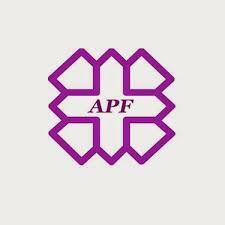 We hope that you choose the APF! Each and every donation to the APF will have a huge impact toward helping people impacted by Porphyria. Get ready to join the movement and share with your community!! All of these things are extremely problematic because the chances are high that everyone living will have an invisible disability eventually. As with everything, the longer you live, the more chances you have to experience something. However, just because age is correlated with illness doesn’t mean that age alone causes illness. Certain illnesses are just a matter of time and chance, yet health is treated as a static reality and youth as invulnerability. If you only view illness as an age-related event, you can’t fully advocate or recognize the millions of children and young adults who are afflicted. Even doctors who know I have chronic illnesses have still referred to me as healthy, as if my lack of years automatically cancels out the fact that some days I’m about as mobile as a corpse. Just because some of us are “young” doesn’t automatically make us healthy. It erases our experiences and makes us feel even more useless when compared to other people our age. We aren’t capable of the same things the rest of our age group is, and it hurts to be reminded of that. Health is assumed to be the default state, when in actuality, illness is much more likely and more common than realized. As a chronically ill person, health is just a myth to me – some fairy tale. I don’t know how many others feel that way, but I bet it’s a lot. Health, as commonly defined, is unattainable for those of us with painful chronic illnesses. Yet that doesn’t mean all is lost. Become a better access ally. Lessen the impact these problems have by realizing that chronic illnesses affect the entire being: heart, mind, body, and soul. They change the ways we can move in the world, so have consideration for those who have no visible signs of illness. Our lives depend on it. Don’t assume that we’re lying when we tell you we can’t do something. Instead, propose an alternative that helps us. Ask what you can do around the house or offer to give us a massage. These are just some steps toward building communities of care. Though we may be smiling and laughing, that doesn’t mean we’re not in pain. It doesn’t mean we’re healthy. We are diverse as any other population, and we deserve information tailored to our needs and desires just as much as you do. Keep us in mind, even though our struggles are invisible to you! We hope you enjoyed reading over the six part series and know your never alone! Speaking of ineffective, even those who are active disability advocates fail to take into account the intersections of disability with other identities and realities. Even certain types of disability are pushed to the margins. The most common invisible illnesses spoken of are mental disorders like schizophrenia and bipolar disorder, along with the neurodivergent experiences of autistic people. But this means that anyone without a popularized chronic illness is marginalized within both media and disability movements. There are plenty of disabled people saying they wanted to be treated like they’re normal, but for those of us with chronic pain, that’s the opposite of a solution. Treating us like “normal” people, or even other disabled people, will absolutely make things worse. Recently, I attended a disability festival. It was the most disability-inclusive environment I’d ever been in, with sections for the deaf, those with low vision, those in wheelchairs, and more. Yet even they failed to take chronic pain sufferers into account: the chairs were rigid and hard. I nearly lay down on the floor to relieve the pain those chairs caused. Until you can experience the pain of sitting, the pain of a breeze, you have no idea what chronic pain can do to a body. No one helps, and everyone tends to be skeptical about invisible illness, because they assume laziness is more likely. Especially here in the United States, where being weak, injured, or otherwise unable to work is viewed as despicable. Just try going through the social security process or trying to keep a job with an illness that leaves you unable to move or function for days, for weeks, for months. Worse than that, many of the services disabled people need are viewed as luxuries, as leisure activities. If you’re rich or well off, it’s acceptable to get regular massages, to take vacations, to have housecleaners and in-home nannies. You might be made fun of for it, but it’s not considered unusual. Yet when my fibro keeps me from doing basic chores or shopping or dealing with strict work schedules, I am looked upon with scorn and disbelief. 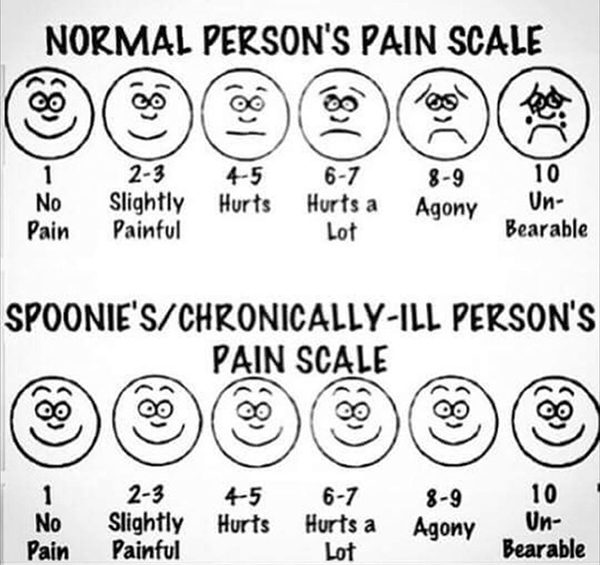 Most people have no idea what it’s like to be chronically ill. They take their health for granted. They view it through their lens instead of through our eyes. And of course, if they did what we did – or, rather, what little we’re able to – it would be because they were being lazy or seeking out a luxury. In-home care, service animals, and pampering activities are often necessities for people who have painful chronic illnesses. It’s the only way to lessen our symptoms and be able to have enough spoons (energy) left over to take care of ourselves. We are not and never will be healthy. But we’d like to get as close as we can. That involves those services and relaxation activities that everyone else takes for granted. Because while we have some “good days,” that doesn’t mean we’re actually feeling better. Which actually leads right into the next problem. Unlike popular medical shows like House, many people with an invisible illness can actually have more than one. It’s like winning the world’s worst lottery. The first illness I was diagnosed with was endometriosis. Then the doctors realized I had PCOS (polycystic ovarian syndrome). Then – due to my stressful life circumstances, my traumatic history of sexual and emotional abuse, my intense work schedule, and the fact that my body was so used to being in pain – one day I woke up in an immense amount of pain that simply never went away. Fibromyalgia: the nervous system literally operates on 100%, constantly engaging the flight or fight response until all it can do is turn on itself, electrocuting you from the inside, causing body-wide muscle aches, disrupting your temperature, making all of your senses even more sensitive, and leading to chronic fatigue and brain fog. That’s not all it does; that’s just the beginning. Yet this is the actual slippery slope of chronic illness. If you have one already, you’re more likely to develop others. I didn’t just develop full-blown fibromyalgia; I also found myself depressed and anxious from dealing with each of my physical illnesses and painful history. My PCOS alters my hormone levels, which leads to cyclic depression that matches my menstruation. Add that to the PMDD, and you have my very many suicide attempts. Pregnancy and menstruation are dangerous for me in ways most people don’t realize. When I’m unable to receive the care I need and when others belittle or don’t understand what I’m going through, it can lead to isolation, depression, and anxiety. All of my symptoms worsen when life circumstances are also stressful. In societies where simplicity is an ideal, the complexities of living with a chronic illness that no one else can see can make life that much harder. Sometimes, it can even lead to death. When you don’t realize that it’s never just one thing affecting our health, but everything, then you can better understand our fatigue, our depression, why we say we can’t do certain things. You’ll understand that pressuring us about work, education, or other “normal” activities only adds to our stress, which makes every part of our illness worse. Imagine being so frozen with fear and dread that you refuse to get out of your car. Even though you know you’re sick, you know as soon as you step out that people will see your lack of a wheelchair or crutches and do a double take of the handicapped spot you’ve parked in. The sad truth is that unless your disability is blatantly physically obvious, able-bodied people assume you’re just like them. Yet the truth is that about 96% of us disabled people have what are called an invisible illness. And because they’re invisible, people assume we’re faking all the time. And the scariest thing is that many painful chronic illnesses go without acknowledgement or recognition from society, even within disability circles. An invisible illness can be mental, physical, or both. There usually aren’t too many outward signs of said illness, which is why the phrase “but you don’t look sick” is both widespread and completely missing the point. I look like a rather healthy and young person. And yet, I have maybe ten invisible illnesses. Starting with my very first menstrual cycle, I spent two weeks out of every month doubled over in pain, wanting to kill myself, being told it was all in my head. I grew older and eventually the intense pain spread to the rest of my body. And as the sexual and emotional abuse worsened, so did my mental health. Eventually I became a bit of a shut in. Then I began receiving worse and worse diagnosis of chronic – invisible – illnesses. The most debilitating ones are endometriosis, Polycystic Ovarian Syndrome, Premenstrual Dysphoric Disorder, and fibromyalgia. I don’t suffer as much from my Post-Traumatic Stress Disorder anymore, but I do still deal with secondary depression and anxiety. Most of these are things people have never heard of, or ones that people didn’t realize could apply to people like me. Most people lack the information or experience to empathize with our struggles. So here are six experiences you may never have realized people with chronic illness have to deal with. For EPP patients it would be wonderful to be able to withstand and even enjoy more time in the outdoors, and to gain potential benefits for liver health. Being able to better avoid flare-ups from EPP is an important treatment goal, as Dr. Bloomer and Dr. Roth both noted that the main treatments available for the pain of EPP symptoms are aspirin, Tylenol (acetaminophen) and cold compresses. Dr. Bloomer encouraged everyone interested in the trials to stay in touch with the APF—we will let you know as soon as we have concrete information about afamelanotide trials. Almost all of the call participants wanted to know if they will be able to participate in afamelanotide trials and when the trials will start. Here we summarize some of the remaining issues addressed during the call—a full account is on our website. • Liver disease. Dr. Bloomer stressed that very few people with EPP will develop liver disease, and that the best way to prevent liver disease is through vigilance and prevention: protect your skin carefully and have your doctor check your protoporphyrin levels at least once a year. • Surgical lights. Dr. Bloomer said it is absolutely necessary to cover surgical lights with UV protective films in EPP liver transplant surgery to prevent burns to the skin and internal organs. It is good caution to use the same films in other surgeries on EPP patients as well. • Drug safety in EPP. Both doctors stressed that EPP patients should avoid drugs, like estrogens, that are known to block the flow of bile. But Dr. Bloomer cautioned against confusing the medication issues in EPP with those in the acute porphyrias—the drug precautions for acute porphyrias do not apply in EPP. • Donating blood, organs and bone marrow. EPP patients should absolutely not donate bone marrow, to avoid giving EPP to the marrow recipient. Donating whole blood and organs other than the liver should be safe. • Current recommendations for the annual blood tests for EPP patients are on our website at www.porphyriafoundation. com/about-porphyria/types-of-porphyria/EPP ~ Dr. Roth’s recommendations for an EPP medic alert bracelet: www. brighamandwomens.org/eppref/Patient/medicalert.aspx ~ For UVF protection, Dr. Roth recommended Llumar auto glass film: www.llumar.com/en/Automotive.aspx ~ COTZ Total Block (with Titanium Dioxide and Zinc Oxide), available from sunprecautions.com ~ coolibar.com and others, as sunblock; and mentioned the Solumbra line of clothing from www.sunprecautions.com 65077 XT , not suo H, 087 eti uS, ya wdoo W0094 det seuqer eci vr es sser ddA The information contained on the American Porphyria Foundation (APF) Web site or in the APF newsletter is provided for your general information only. The APF does not give medical advice or engage in the practice of medicine. 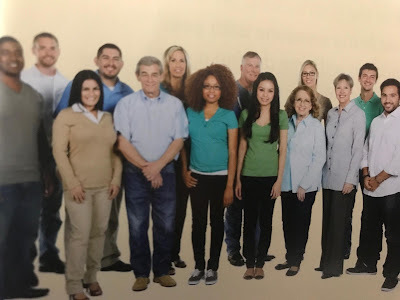 The APF under no circumstances recommends particular treatments for specific individuals, and in all cases recommends that you consult your physician or local treatment center before pursuing any course of treatment. All information and content on this Web site are protected by copyright. All rights are reserved. Users are prohibited from modifying, copying, distributing, transmitting, displaying, publishing, selling, licensing, creating derivative works, or using any information available on or through the site for commercial or public purposes. Members in the Atlanta, GA area are invited to attend a Patient Education and Support Meeting. There will be a presentation and question/answer session with an on-site Porphyria expert (Dr. John Phillips). Come meet old and new friends who share your experiences with Porphyria. Please RSVP to Edrin Williams in the APF office at 1.866.APF.3635 oredrinw@porphyriafoundation.org. We look forward to seeing you there! Please see the invite below for additional meeting details. Emmy nominated Dateline NBC documentary "Out of the Shadows" will re-air on Wednesday, November 8, 2017 at 4:00 AM. Please set your DVRs to watch this important documentary featuring EPP. The Cook family is preparing to put on another fantastic barrel race. As you may know, the Cook brothers, Cason and Caul, have EPP and have set a great example about enhancing awareness of the disease in their community. The shadow race will be held in their hometown of Vernon, Texas. All proceeds will benefit the American Porphyria Foundation. 2018 HEME BIOSYNTHESIS AND THE PORPHYRIAS: RECENT ADVANCES SCIENTIFIC CONFERENCE and CLINICAL DAY FOR PATIENTS! Mark your calendars to join the American Porphyria Foundation and the Genetic Disease Foundation along with expert physicians from around the world! Click on the link below to view the agenda and register for Clinical Day for Patients. We look forward to seeing you there. If you have any additional questions, please contact the APF at 1.866APF.3635. ALNYLAM TRIALS - Recruiting participants! The Alnylam Trials for Givosarin will begin soon. The purpose of this study is to evaluate the use of this medication to prevent or reduce attacks and symptoms in those with an acute porphyria (AIP, HCP, VP, ADP). When enrollment opens, the APF staff will contact you with the name and phone numbers of the participating centers near you. If you are interested in participating for this exciting new trial, call the APF TODAY at 713.266.9617or 1.866.APF.3635 with your name, porphyria type and location to be put on the list TODAY!